iP3: What is OS X Lion Internet Recovery and how does it work? 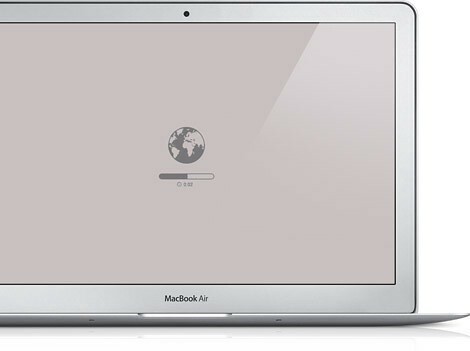 What is OS X Lion Internet Recovery and how does it work? Remember yesterday we told you about a new Lion ability to re-install itself over the Internet? Why would it come in handy? Well, as you know Apple distributes Lion exclusively as a Mac App Store download and the new MacBook Airs and Mac minis no longer ship with the USB stick pre-loaded with the OS installer. Apple is now offering the Lion installer on a 8GB USB key for $70, but most folks likely won’t bother with it. If you need to install Lion on another Mac, you can always re-download your purchased copy off Mac App Store free, but what if your hard drive has some issues? If your Mac problem is a little less common — your hard drive has failed or you’ve installed a hard drive without OS X, for example — Internet Recovery takes over automatically. It downloads and starts Lion Recovery directly from Apple servers over a broadband Internet connection. And your Mac has access to the same Lion Recovery features online. Internet Recovery is built into every newly-released Mac starting with the Mac mini and MacBook Air. Lion Internet Recovery first runs a quick test of your memory and hard drive before putting up a limited interface that lets you select your preferred wireless network. From there, a Lion Recovery HD image downloads from Apple’s servers (note: This is only the recover partition image, not the entire Lion installation) and your Mac boots into it and presents you with the same utilities and functions as Lion Recovery preloaded on the built-in recovery partition. Regardless of whether you booted into Lion Recovery from the recovery partition, by holding Command-R at startup, or your machine automatically downloaded Lion Recovery from Apple’s servers, this mode will let you re-download your copy of Lion from Apple’s servers (it’s a four gigabyte download) and begin the installation process. You will be prompted to enter the Apple ID and password you used to purchase Lion to authenticate your digitally signed copy of the operating system. You must have at least 13GB available on your hard drive after formatting in order to install Lion and an Internet Restore partition. On the final note, your Lion purchase includes iLife applications, but you’ll have to re-download them free from Mac App Store following a successful Lion installation. Also remember that your downloaded Lion installer will be removed from the /Applications folder after your successful first login to a freshly installed system. What if you want to upgrade multiple Macs to Lion? Simple, make a copy of the /Applications/ Install Mac OS X Lion program on external media and run a copy of the installer on your other Macs. This way, you won’t have to re-download the 4GB installer from the Mac App Store on each machine. Bear in mind that this method works only with the same Apple ID you used to download Lion from the Mac App Store. We have received some complaints from users who claim Mac App Store won’t let them re-download Lion following the successful installation. Not to worry, just press and hold the Option key while you click the Purchases tab in the Mac App Store app and the button should change to Install. It is also possible to install Lion on external storage devices, including Thunderbolt drives and memory cards, and boot into the operating system or Lion Recovery from an external drive. In all, the outlined strategy ensures regular users are able to launch into Lion Recovery even if their recovery partition fails or they replace their hard drive with a blank volume. Two caveats: Your computer won’t be able to automatically fetch a Lion Recovery HD image from Apple’s servers if you have no Internet connection and this fallback to Apple’s servers is only supported by the firmware shipped on the latest Mac minis, MacBook Airs and future Macs. Apple did not say whether a firmware update will be provided for older Macs as well. Also, if you’re serious about keeping your Macs in pristine order, you should consider the latest version of the Apple Remote Desktop tool for managing multiple Macs on your network. Apple has just updated the program to version 3.5 with Lion compatibility and new features such as per-user remote control (Apple Remote Desktop 3.5 Admin, Apple Remote Desktop 3.5 Client and Apple Remote Desktop Dashboard Widget). It is now available from Mac App Store for just $80, a huge saving over $400 for a boxed copy. Last, but not the least, if you’re wondering about upgrading your existing Snow Leopard system to Lion, it couldn’t be easier – make sure to check out Network World’s awesome slideshow gallery guide.